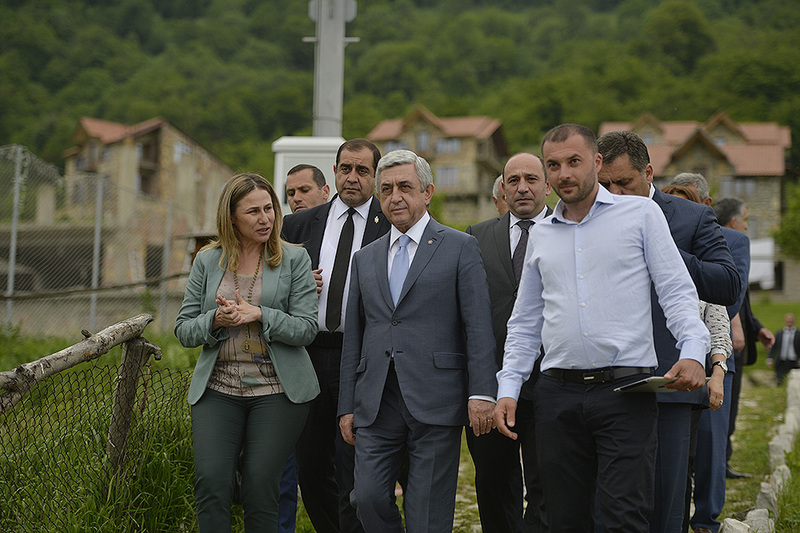 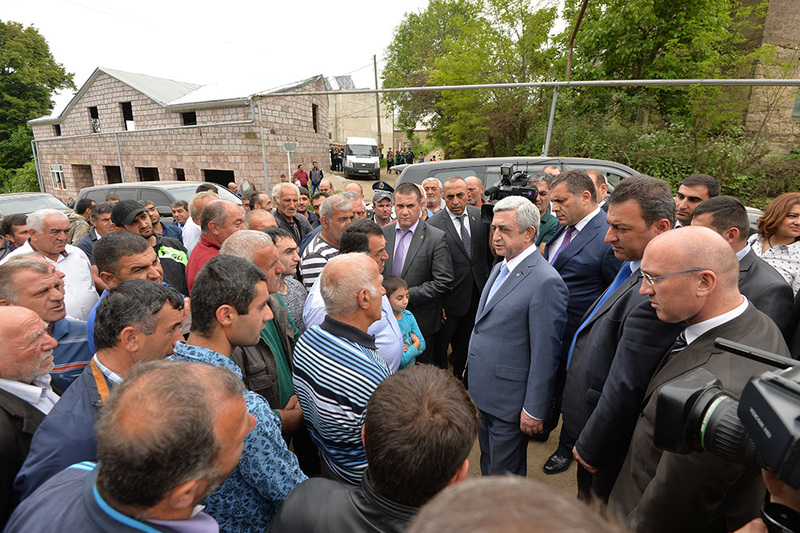 President Serzh Sargsyan paid a working visit to Noyemberyan, Berd and Ijevan regions of Tavush Marz. 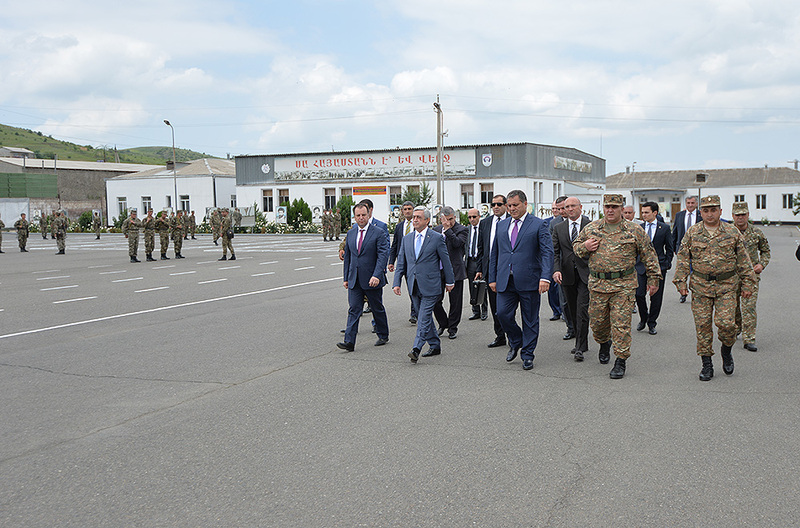 The President’s working visit started at Koghb army unit, where he met with the members of the inter-ministerial coordination commission, which has the task of addressing issues faced in border communities. 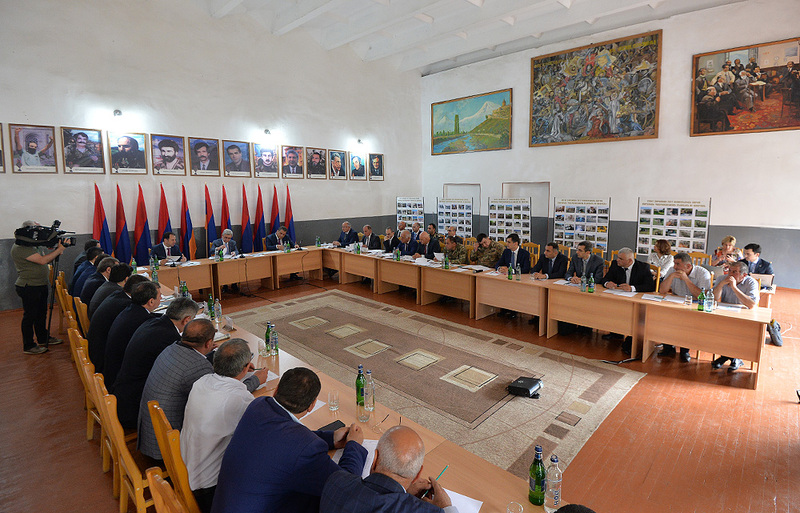 The meeting was attended by the Governor of Tavush Marz and the heads of several border communities. 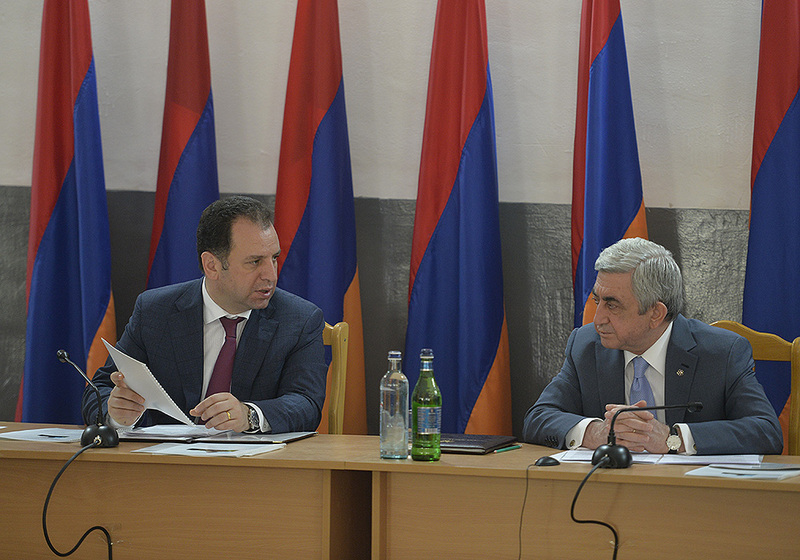 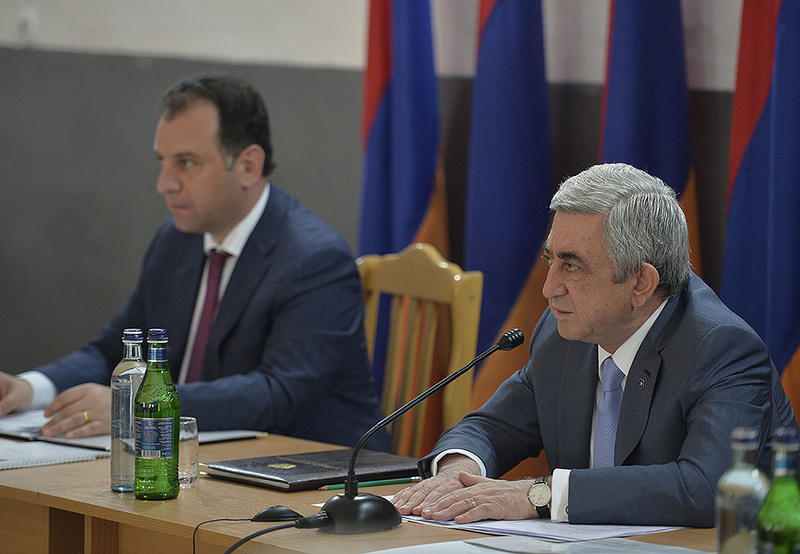 Commission Chairman, RA Defense Minister Vigen Sargsyan and the commission members reported to the President on completed and ongoing activities, the problems identified and the possibilities for their solution. 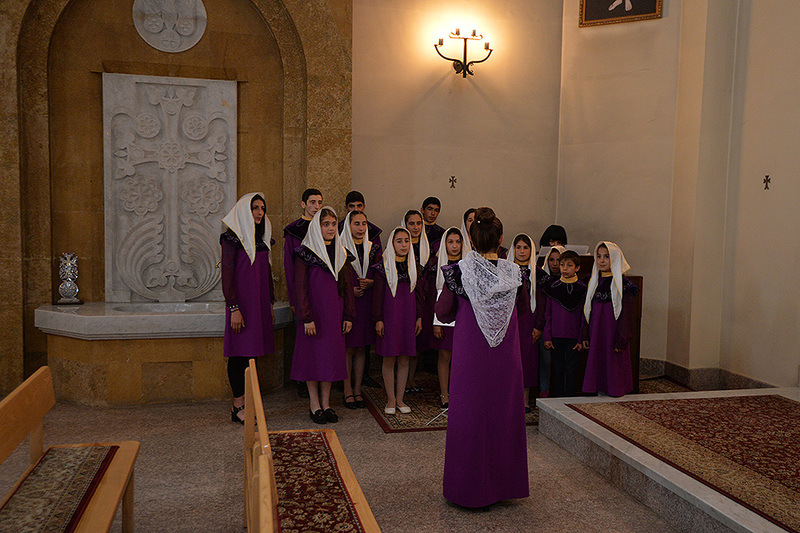 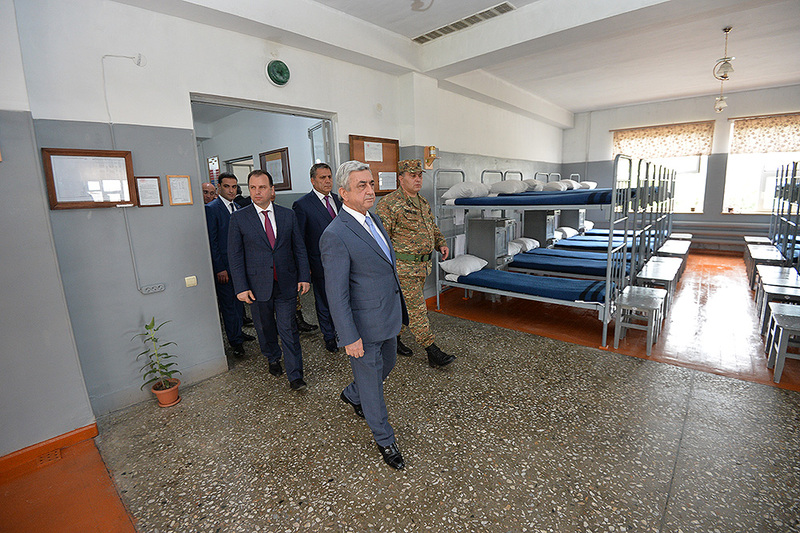 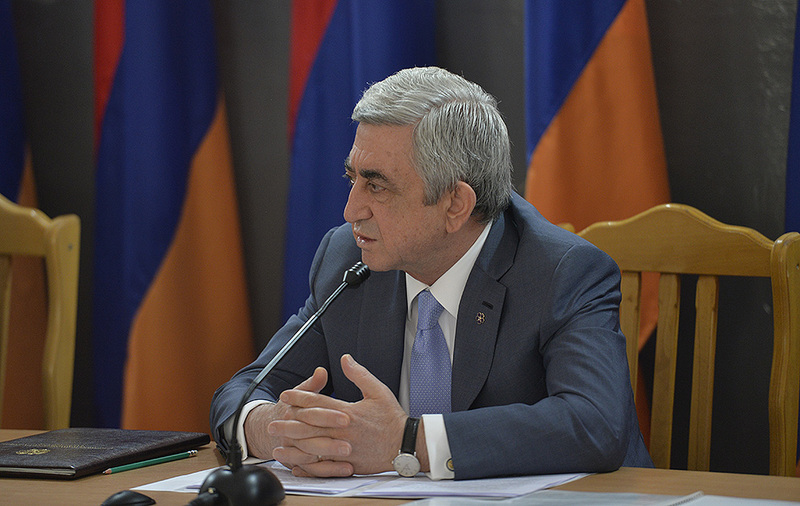 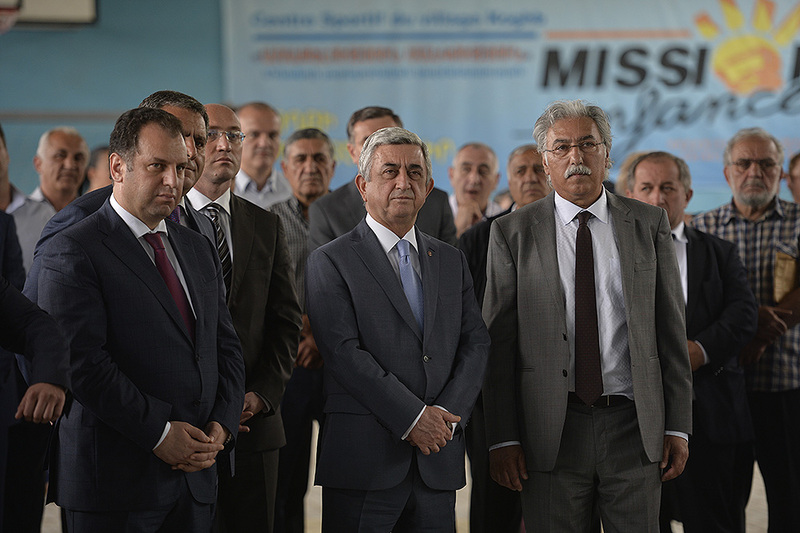 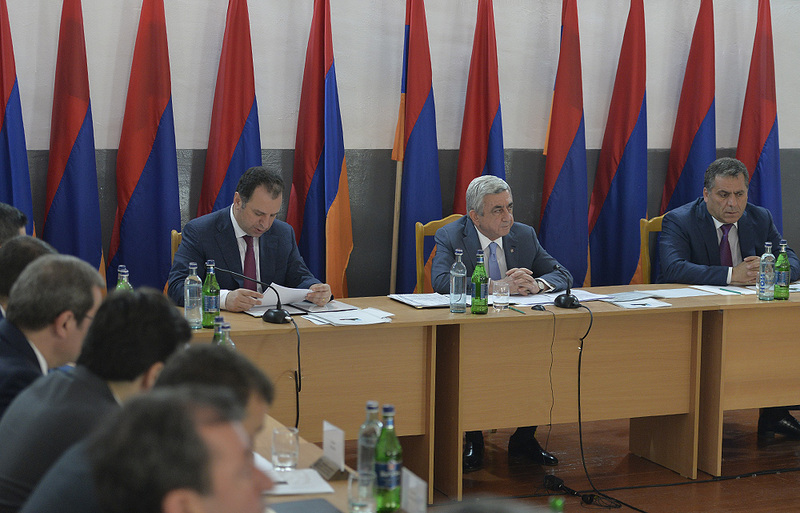 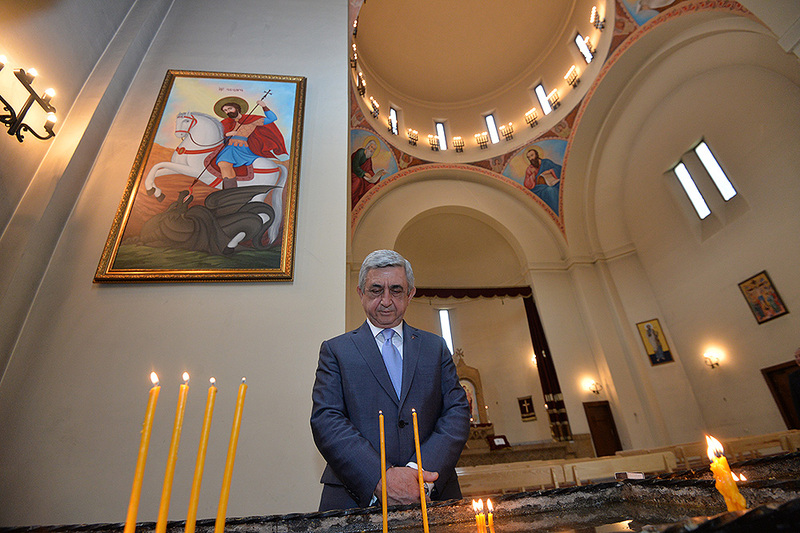 Noting that he has always highlighted the importance of the activities carried out on the spot that help get a first-hand view of existing problems and find solutions, Commander-in-Chief of the Armed Forces and President of the Republic of Armenia Serzh Sargsyan said the Government will do everything possible to support those communities and households holding fast to their native land. 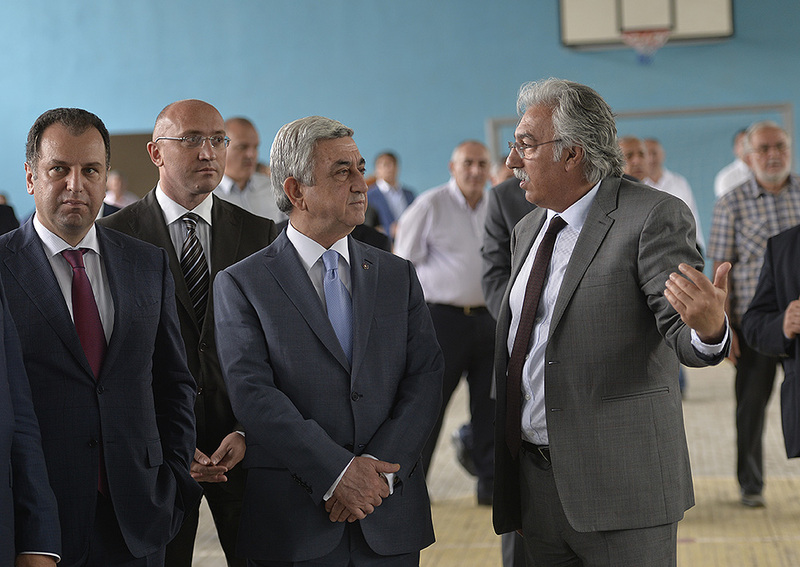 “The pre-election round, followed by the general elections, is complete. 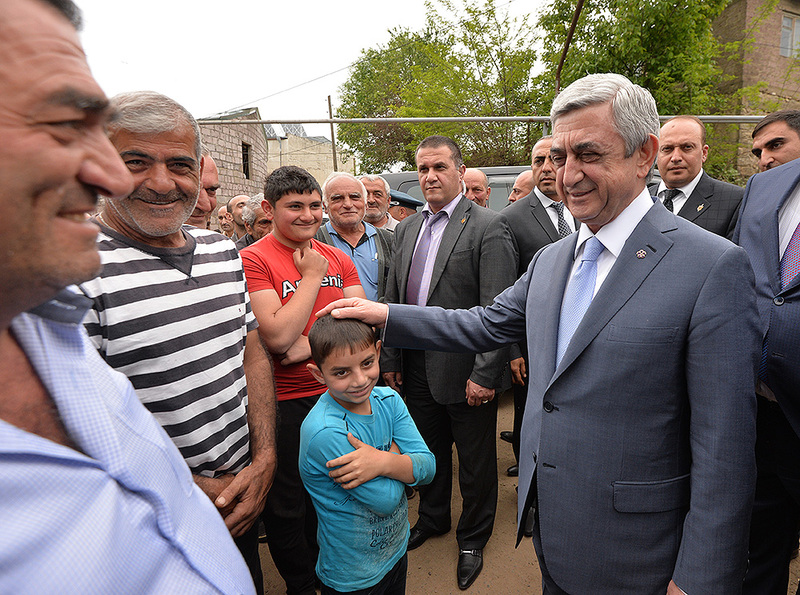 We got the people’s vote of confidence. 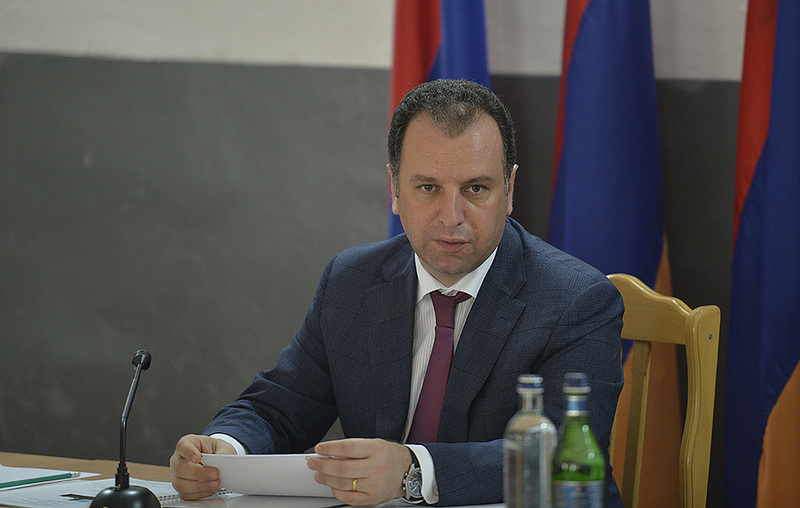 Now the Government, the public agencies and the local self-government authorities have to deal with the problems we face. 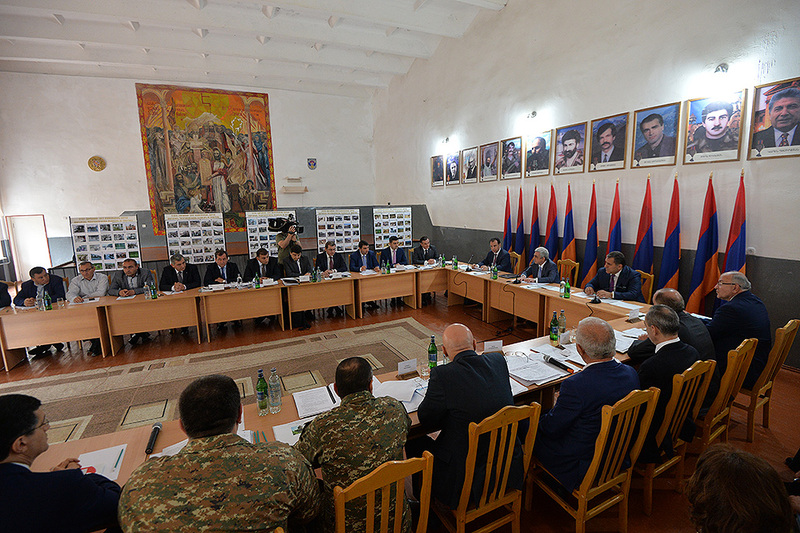 All communities are facing challenges, most of which are obviously similar and call for uniform solutions, but the most challenging problems are faced in our border settlements, because they are aggravated by permanent ceasefire violations, which on the one hand, put an extra strain, and on the other hand, inflict additional losses. 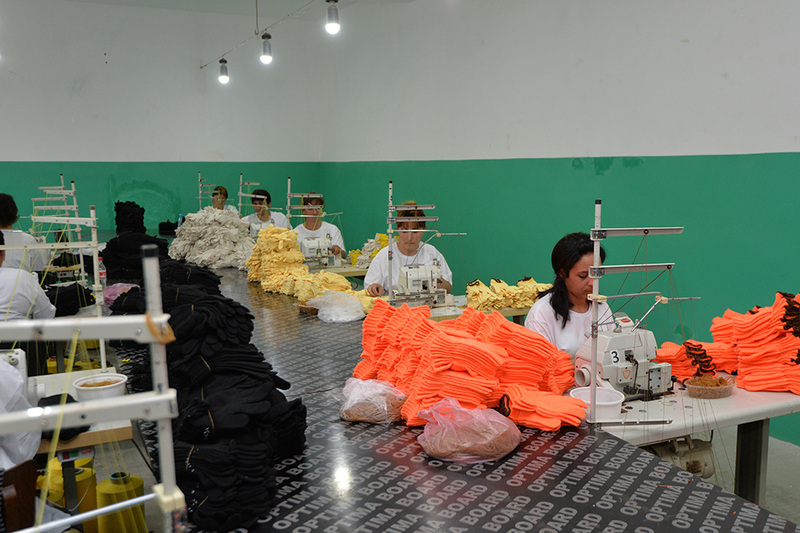 In other words, there is a need for additional work. 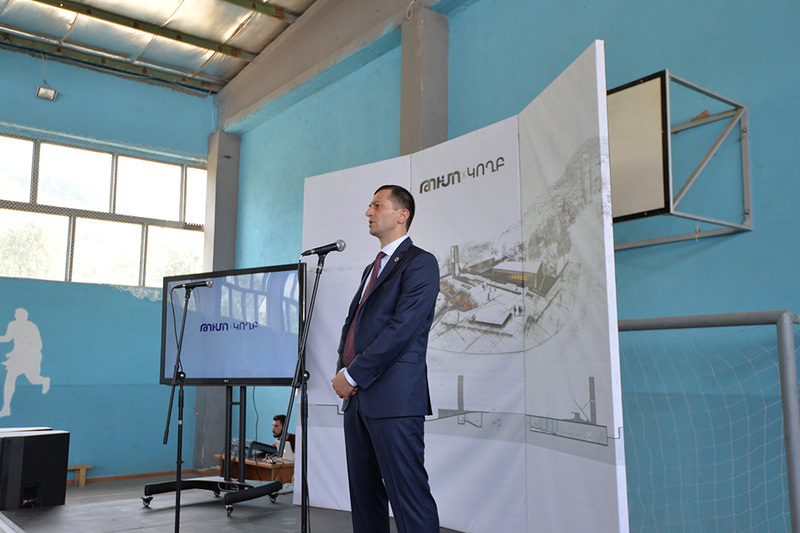 We have granted specific privileges to our communities. 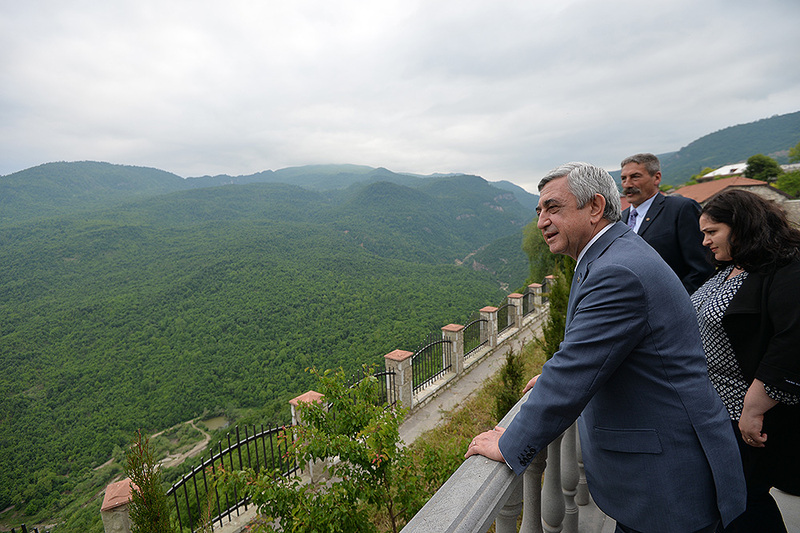 I would like to hear from you to what extent these benefits have been functional and useful, or otherwise, understand the rate of their efficiency and, in general, what else can we do to meet the expectations of our fellow citizens who are holding fast to their native land, who have not abandoned their homeland in the hope that the situation will change for the better. 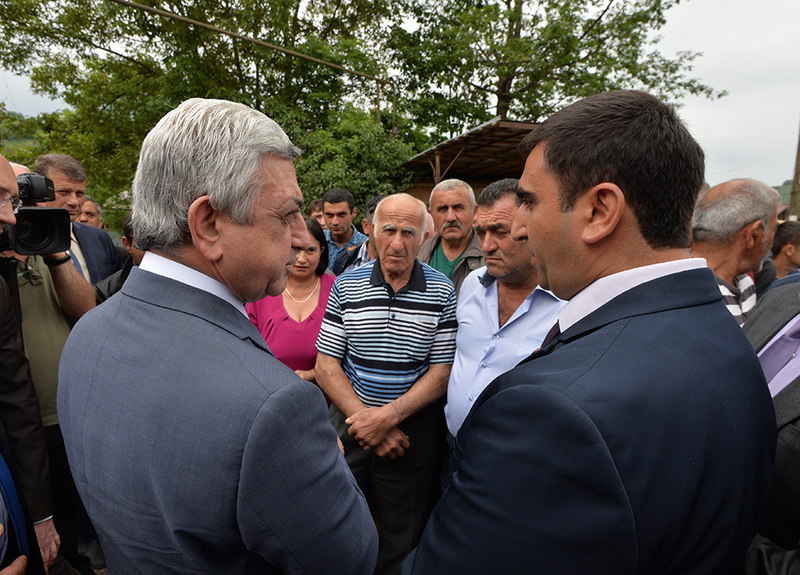 Our government is fully prepared to do practical work on the spot. 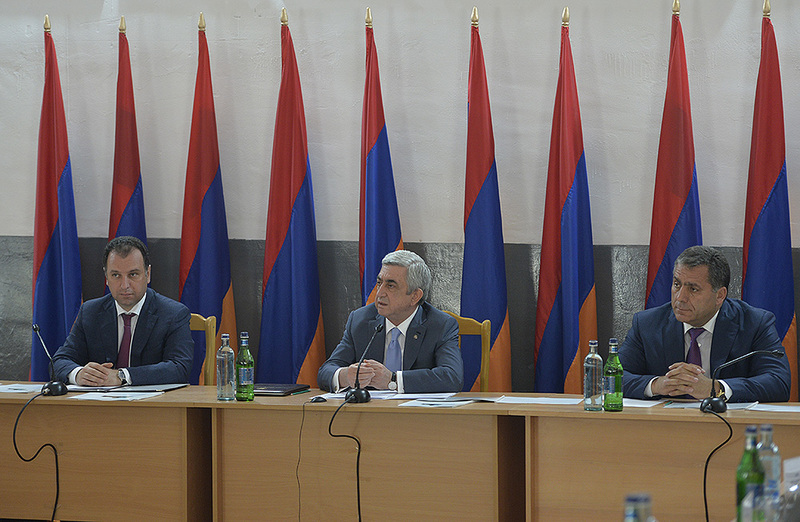 We would like the local authorities to be more active and more realistic. 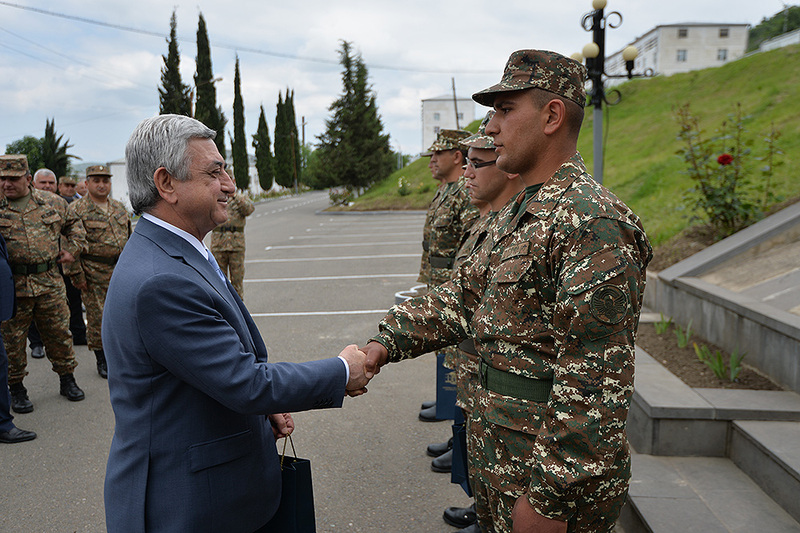 I learned from the Defense Minister that the Commission’s first meeting was held in another region. 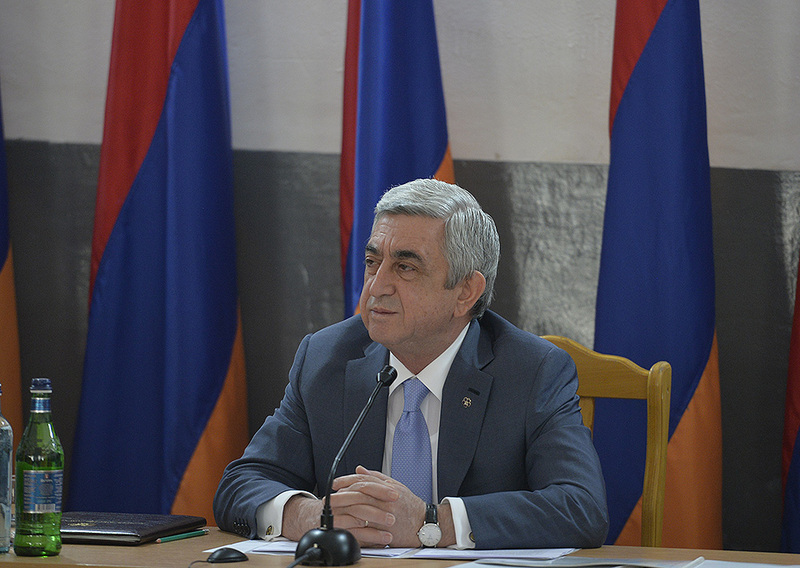 I hope that this structure could actually be useful,” President Serzh Sargsyan said. 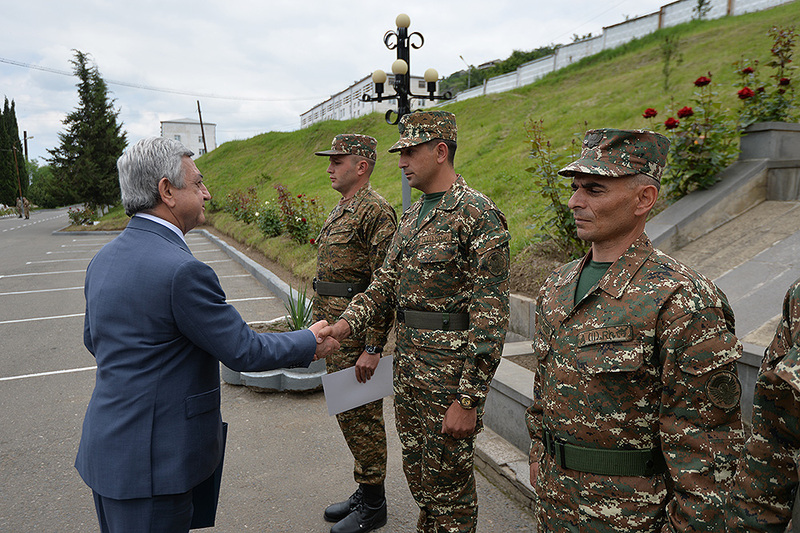 The President next toured the military unit inspecting the regiment’s combat readiness and talking with the soldiers. 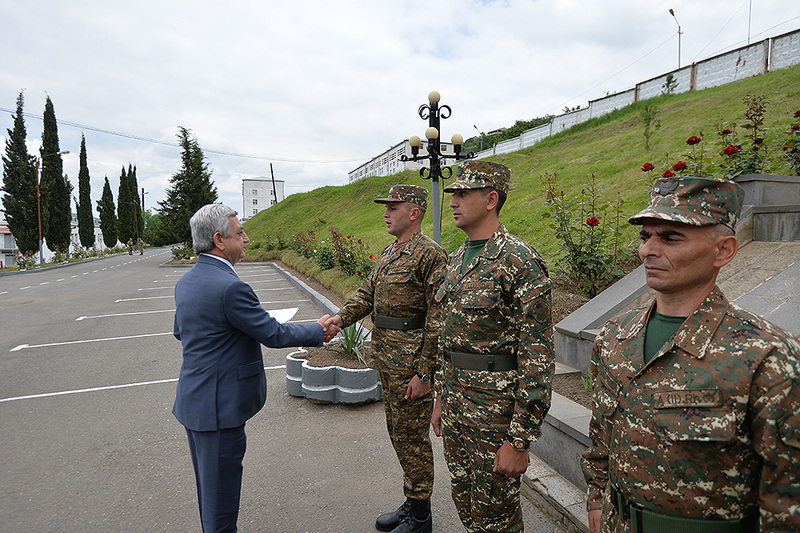 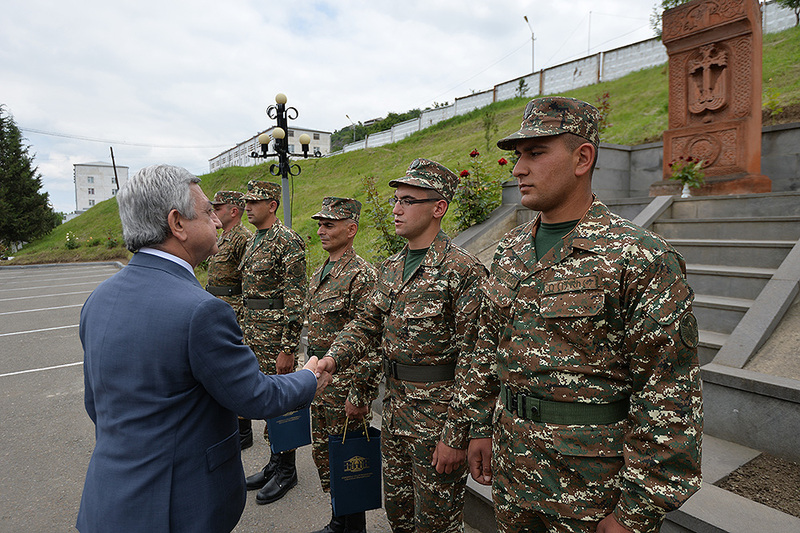 Serzh Sargsyan awarded prizes to a number of soldiers who had excelled in the exercise of their service duties. 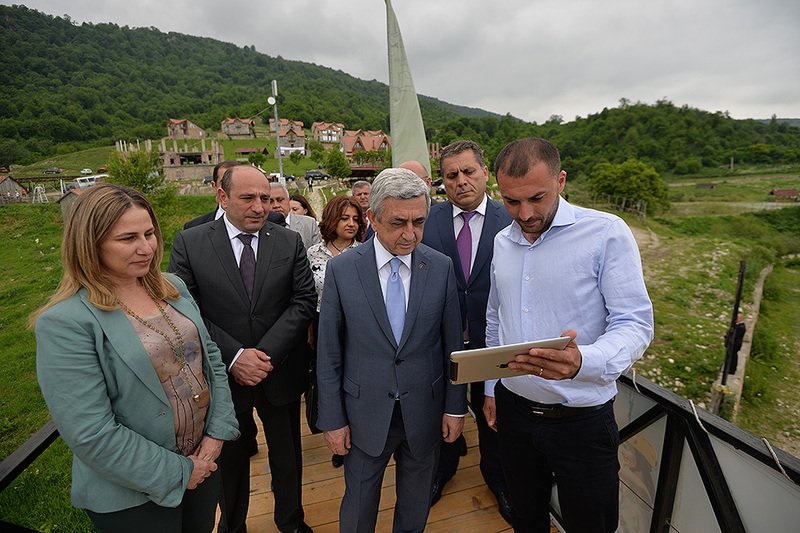 During his working visit, the President attended the groundbreaking ceremony of TUMO Koghb Center in Koghb community - another landmark initiative implemented by the TUMO Center of Creative Technologies. 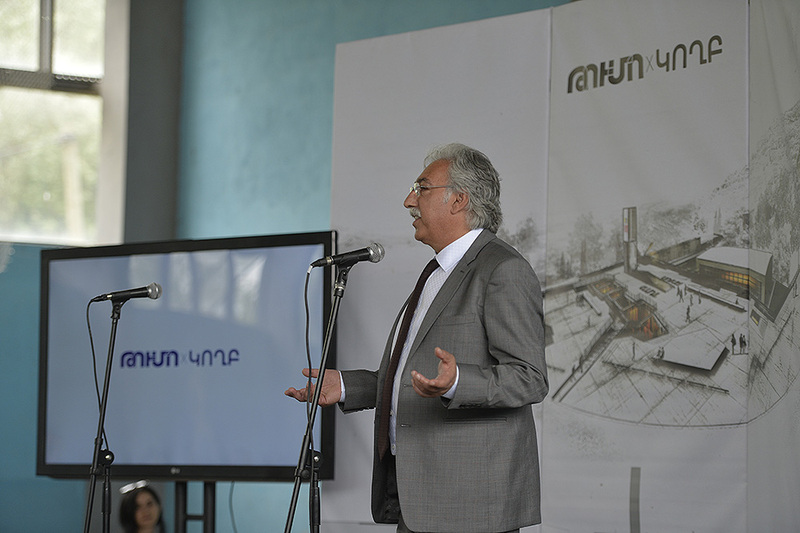 The event was attended by TUMO founder Sam Simonian, representatives from Ucom Company, Koghb Foundation, local self-government authorities and donor organizations. 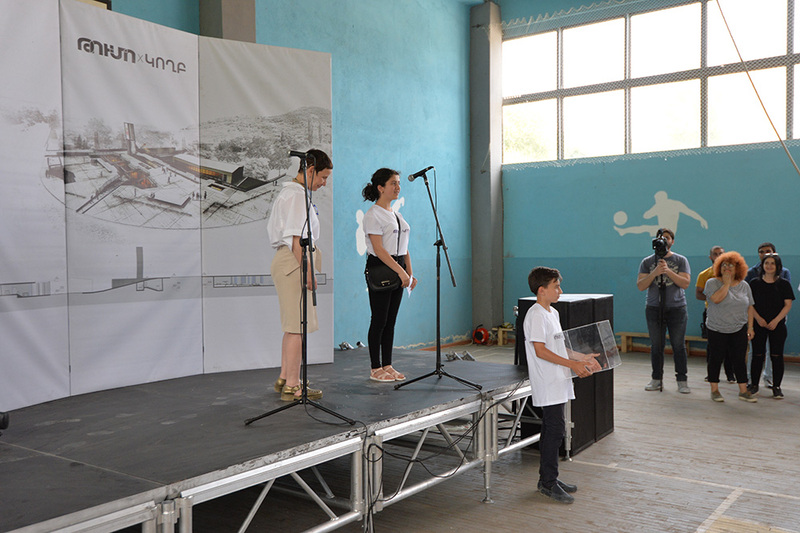 The program officials say the new center will host about a thousand students from Noyemberyan, Berdavan and other local settlements and will use the main educational program of TUMO. 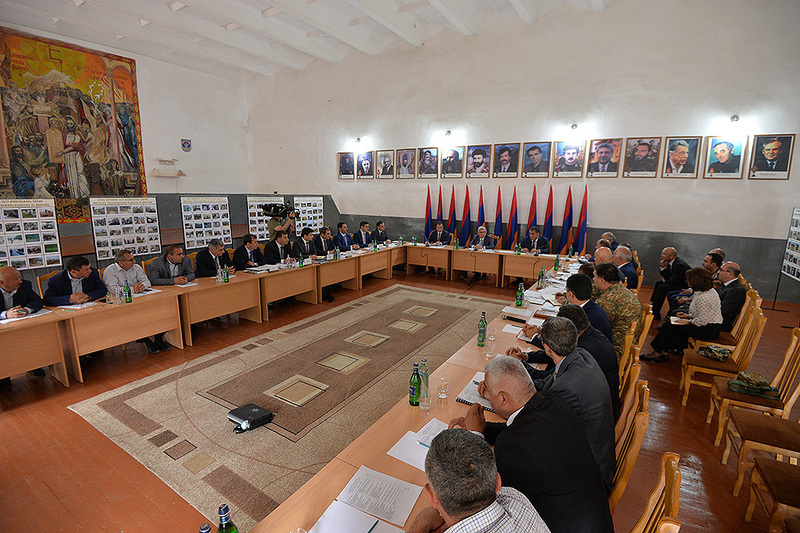 A pilot project referred to as TUMO Army will be implemented in cooperation with the Ministry of Defense, involving the nearby army unit personnel. 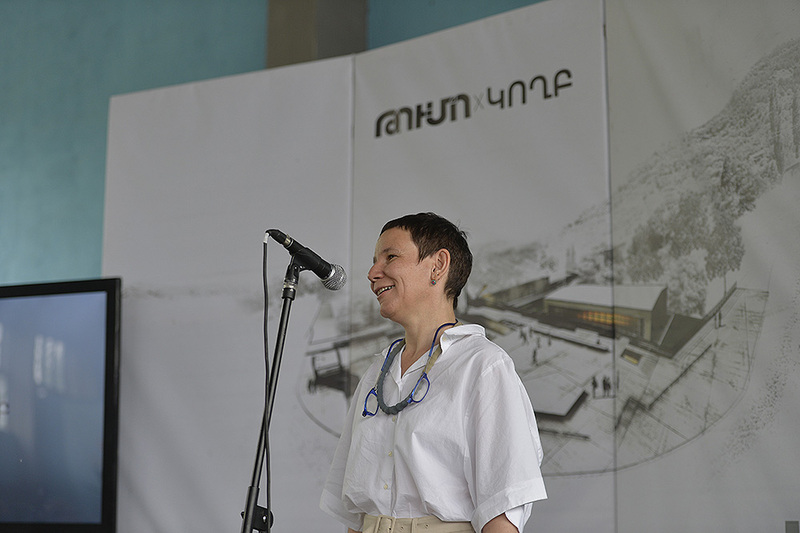 A live video session was held at the construction site of TUMO Koghb, during which the participants could watch the launch of TUMO Gyumri center’s reconstruction. 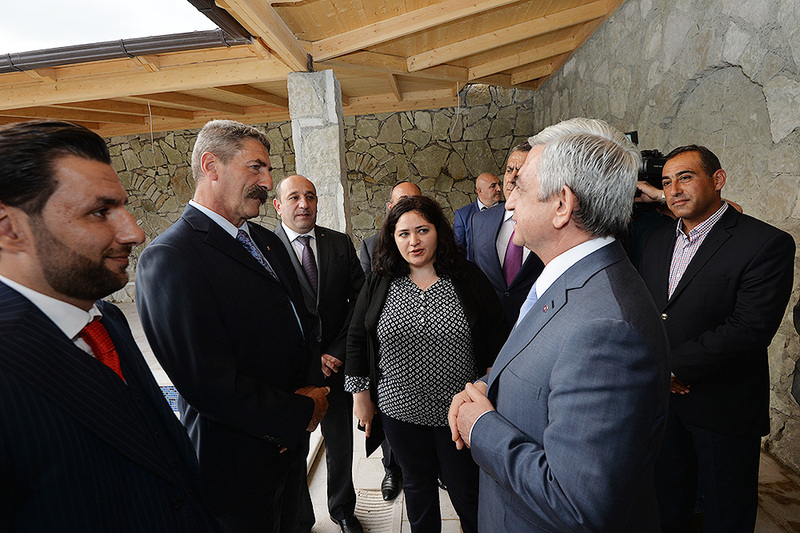 The President talked to Koghb residents and the project sponsors. 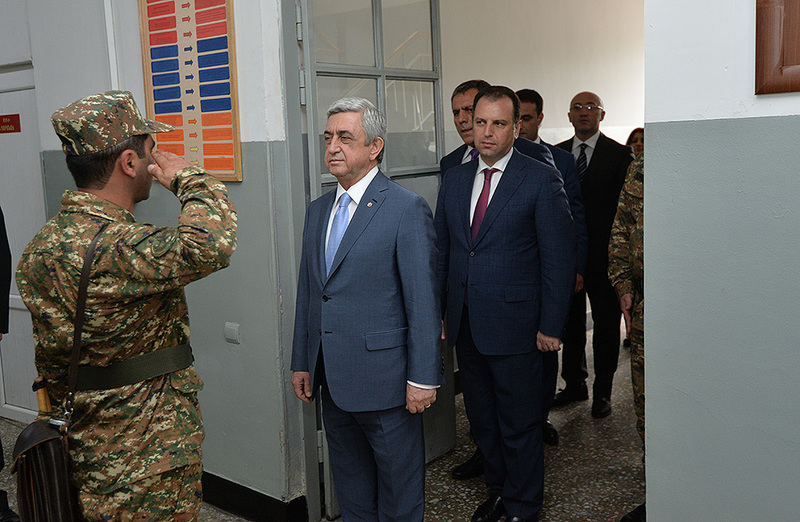 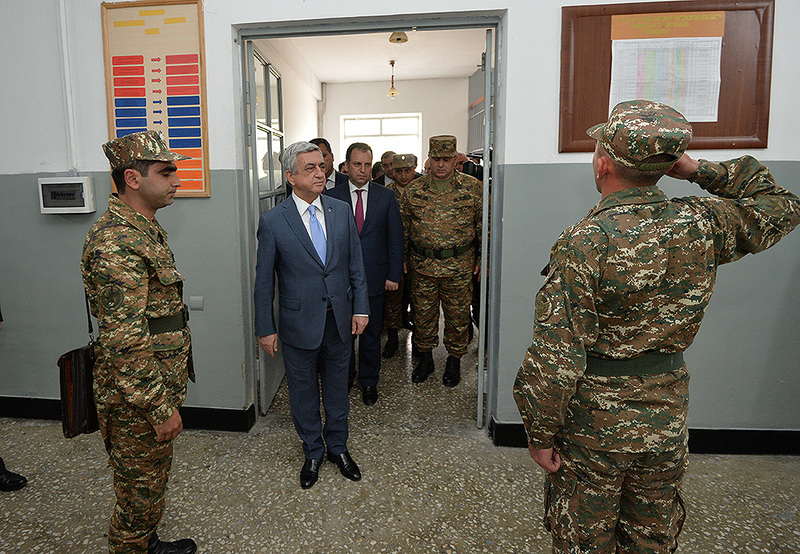 Serzh Sargsyan then visited Armat engineering lab as stationed in high school N2 of Koghb. 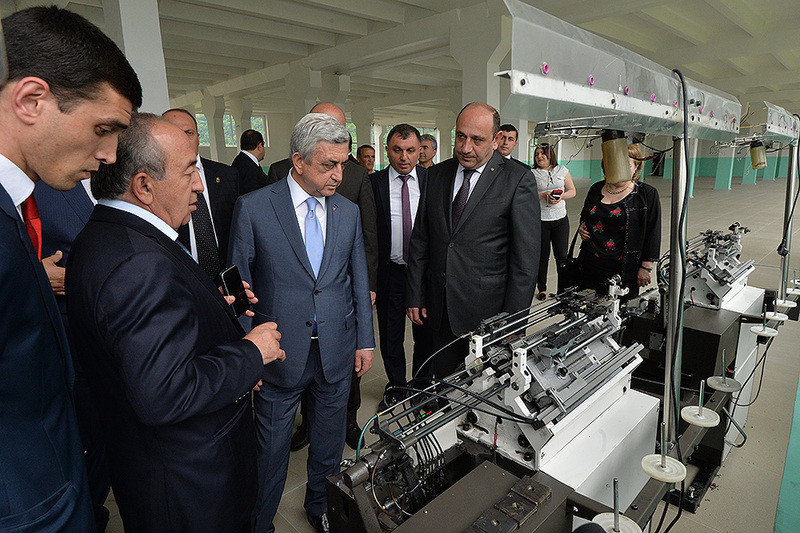 The Head of State got acquainted with the program of establishing engineering labs, launched by the Information Technology Enterprises Union (ITEU) and Ucom Company, which seeks to strengthen Armenia’s technical education base, develop the system of vocational education and train engineering manpower. 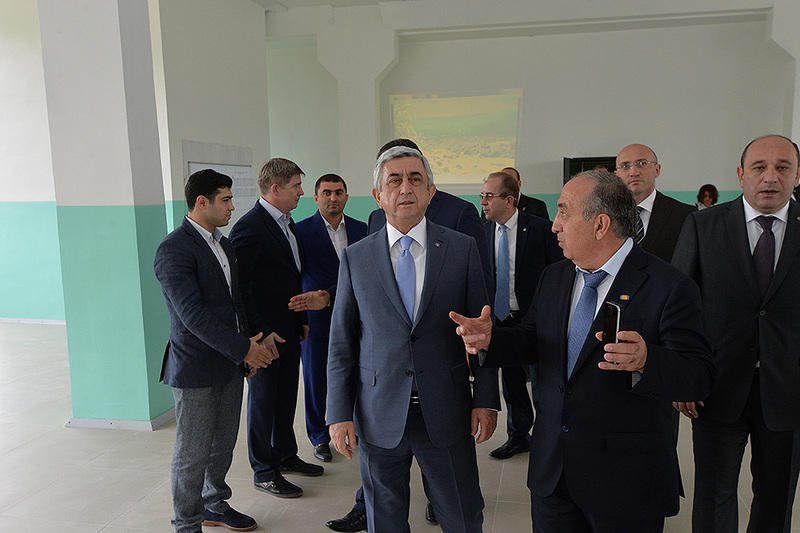 The network of laboratories will make it possible to run engineering groups at some 1,400 schools nationwide in the format of extracurricular activities. 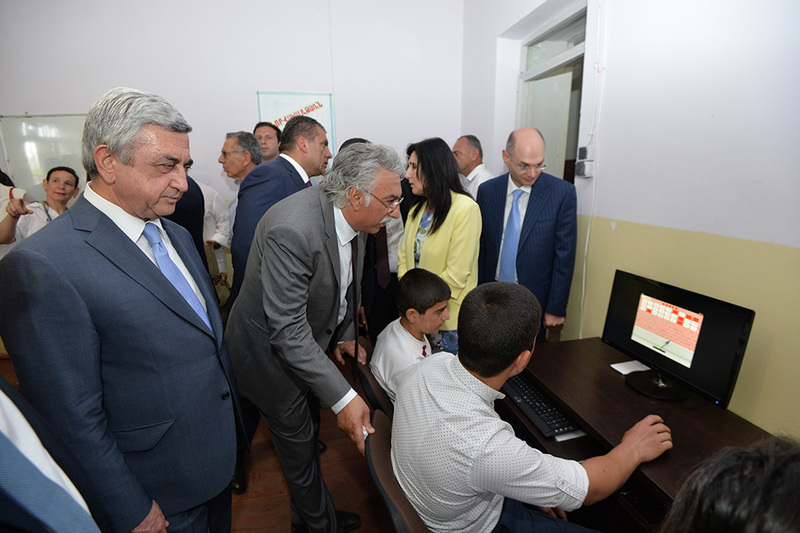 The program also aims to promote schoolchildren’s interest in modern high technologies and develop engineering skills from early childhood. 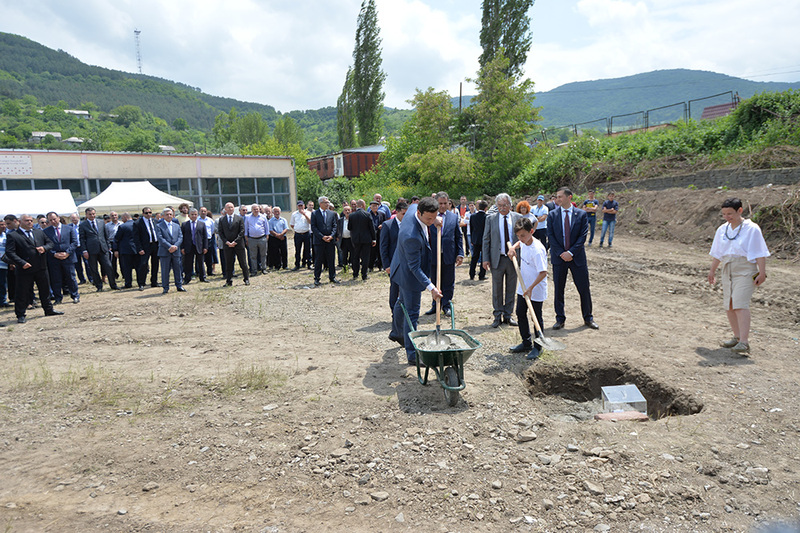 In accordance with the memorandum of cooperation signed between the ITEU and Ucom, the latter has made significant investments into the project, thanks to which many Armat laboratories have been set throughout the country. 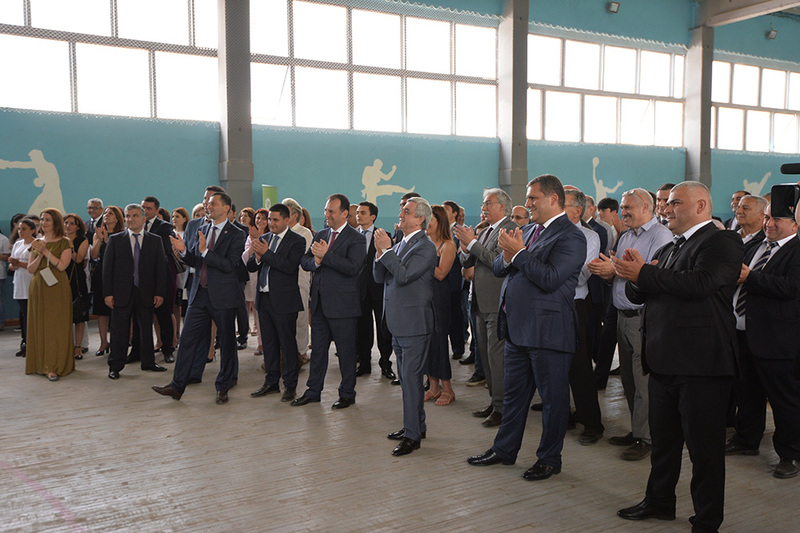 Note that the already operational 200 engineering laboratories and robotics groups are attended by nearly 4,500 children. 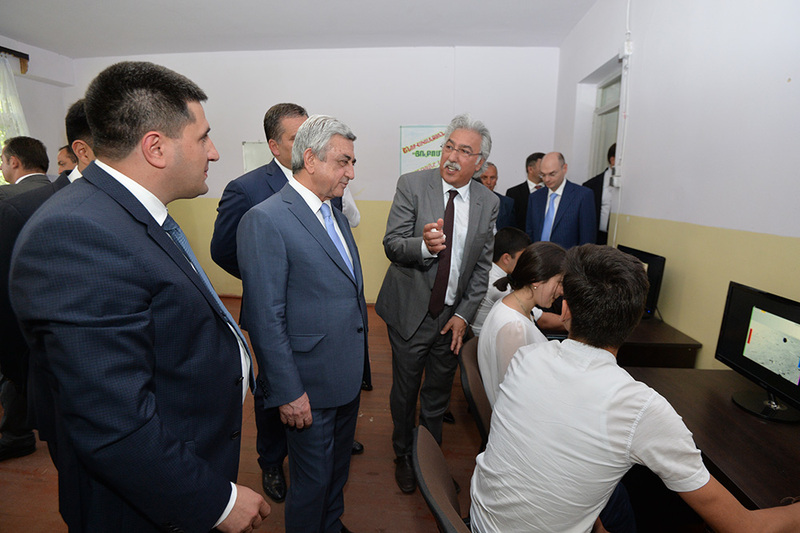 The President took the opportunity to meet with the students Armat lab in Koghb. 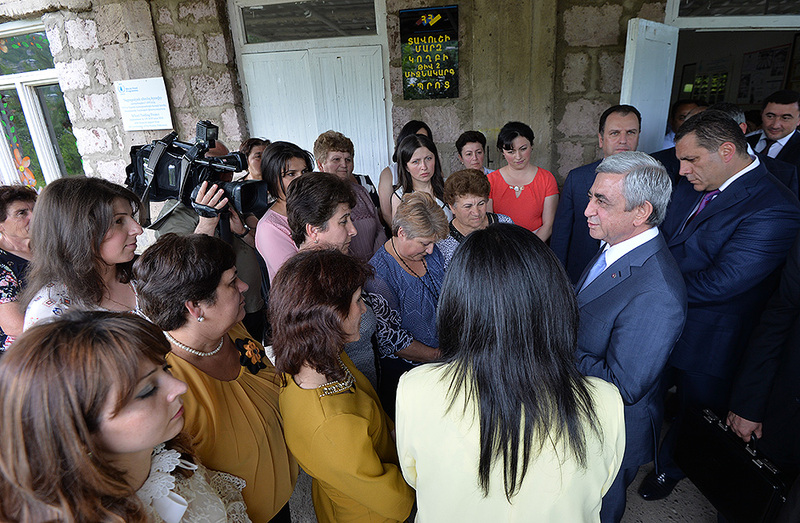 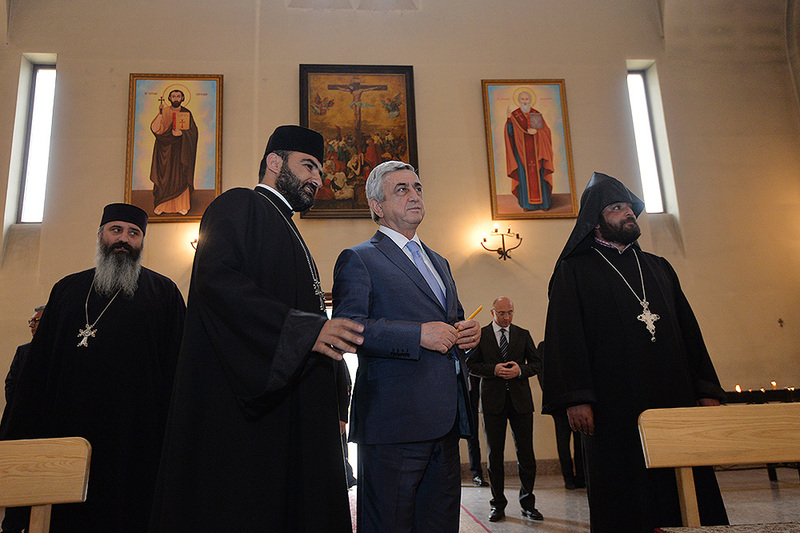 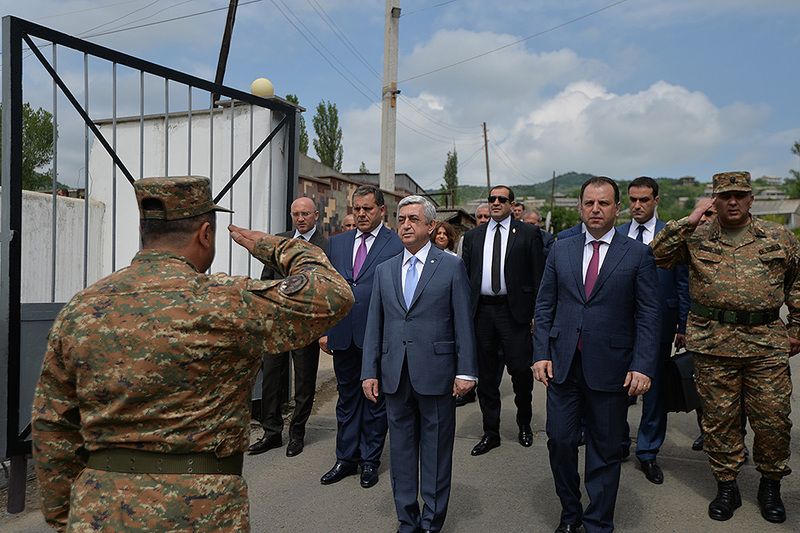 Serzh Sargsyan’s working visit to Tavush Marz continues. 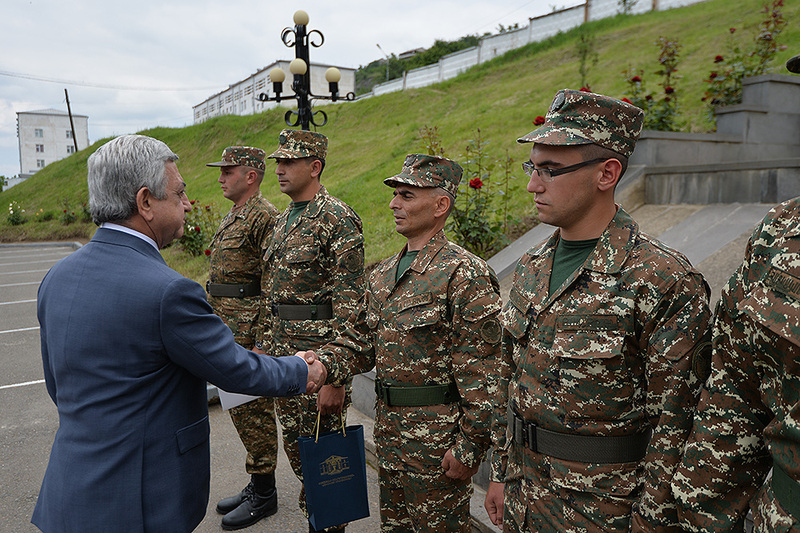 Later today, the President left Noyemberyan for Berd region. 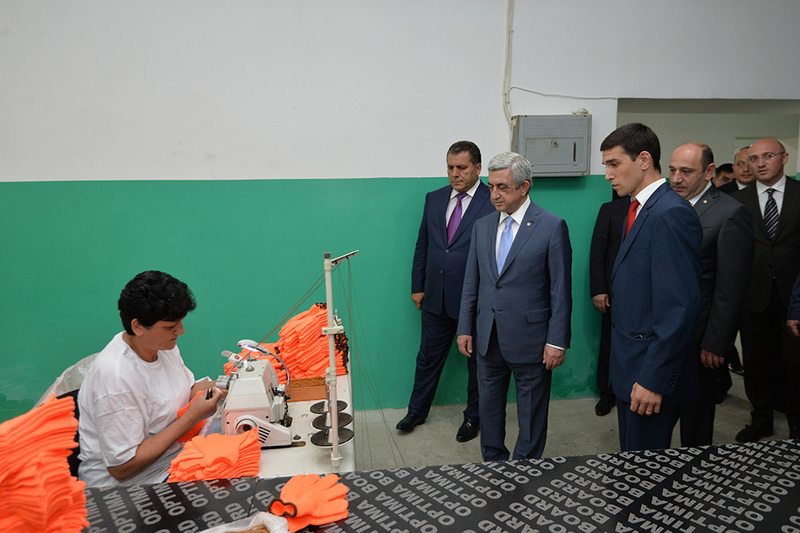 President Serzh Sargsyan visited Tavush Textile Company’s subsidiary in the frontier Artsvaberd community of Tavush Marz. 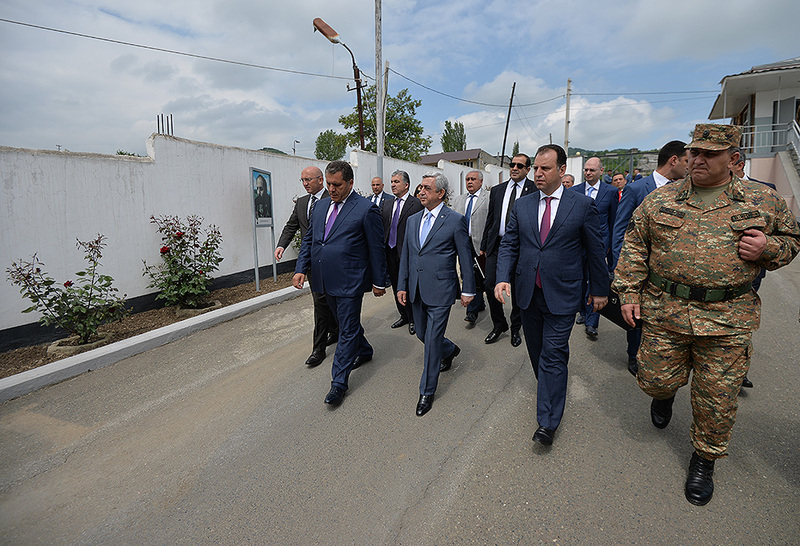 In the company of Minister of Economic Development and Investments Suren Karayan, as well as Tavush Textile’s top executives and Marz administration representatives, the President toured the operational unit, where he was briefed on investments, recent activities, export volumes and development programs. 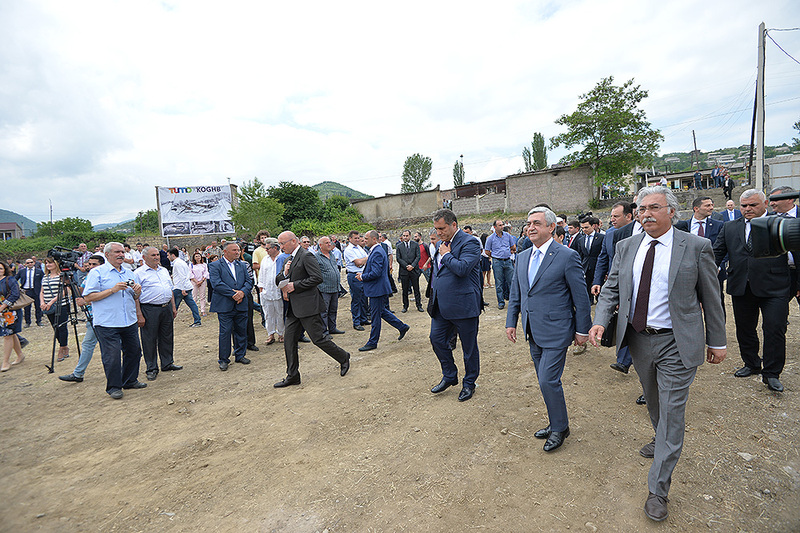 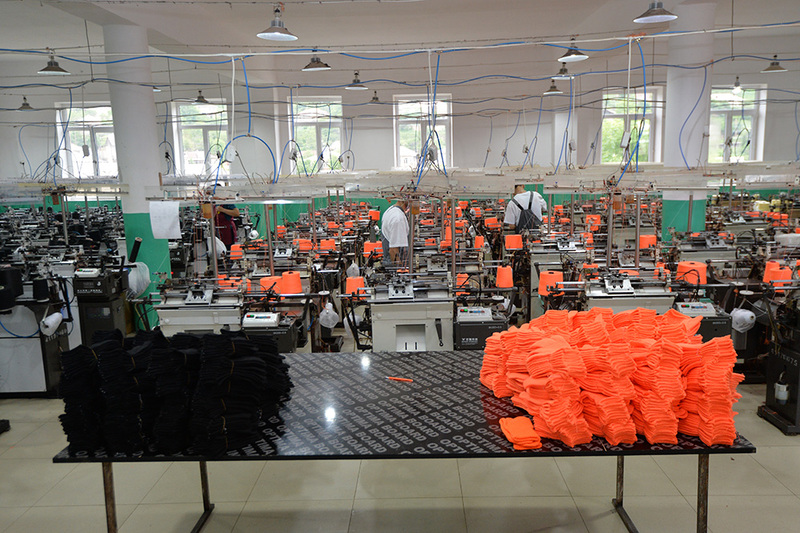 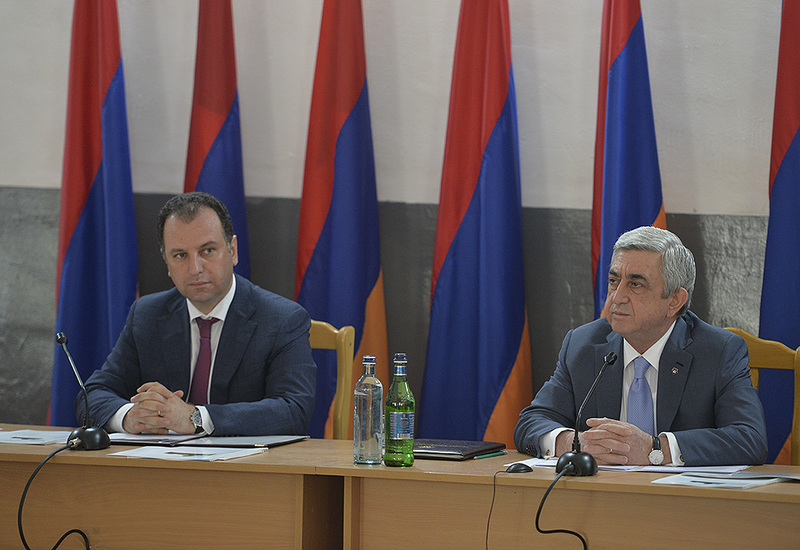 On the margins of his working visit, President Sargsyan called at the Berd branch of Tavush Textile, where he was told that the nearly two-year-old company is running production facilities in Choratan, Artsvaberd and Mosesgegh communities. 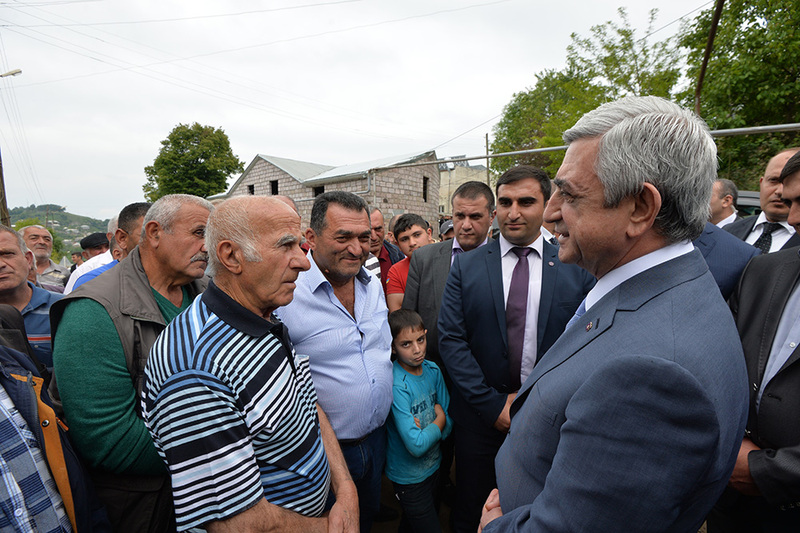 Similar units are currently being set up in Berd and Paravakar communities. 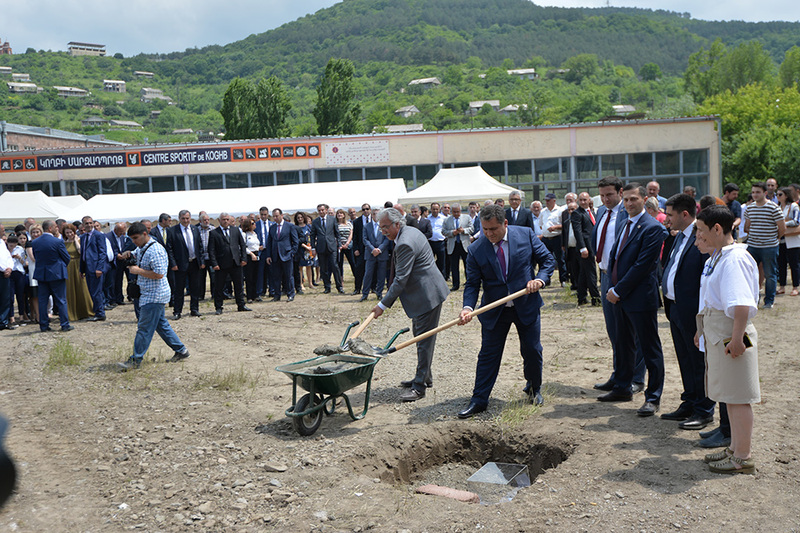 The company employs 274 people with an average monthly salary of 120,000 drams. 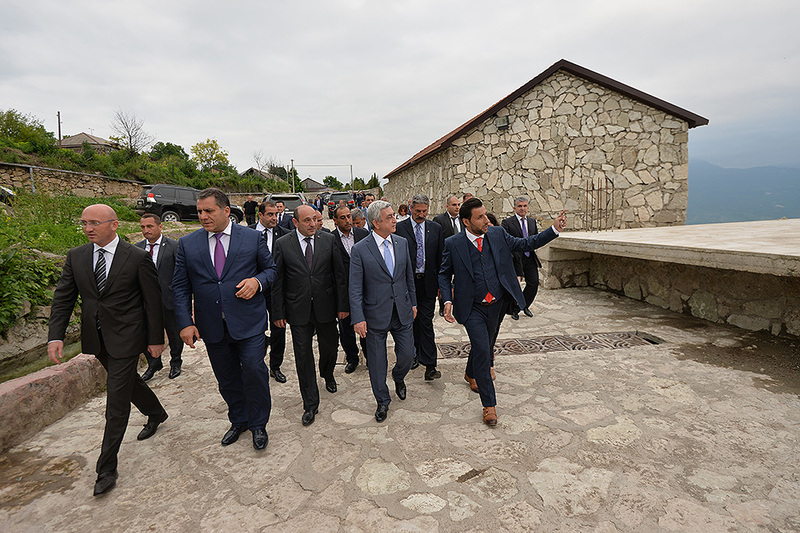 Accompanied by the Minister of Economic Development and Investments, the Chairman of State Tourism Committee and the management of the aforementioned companies, the President inspected the amenities provided for the development of extreme and adventure tourism in Yenokavan, including the complex of hotel infrastructures. 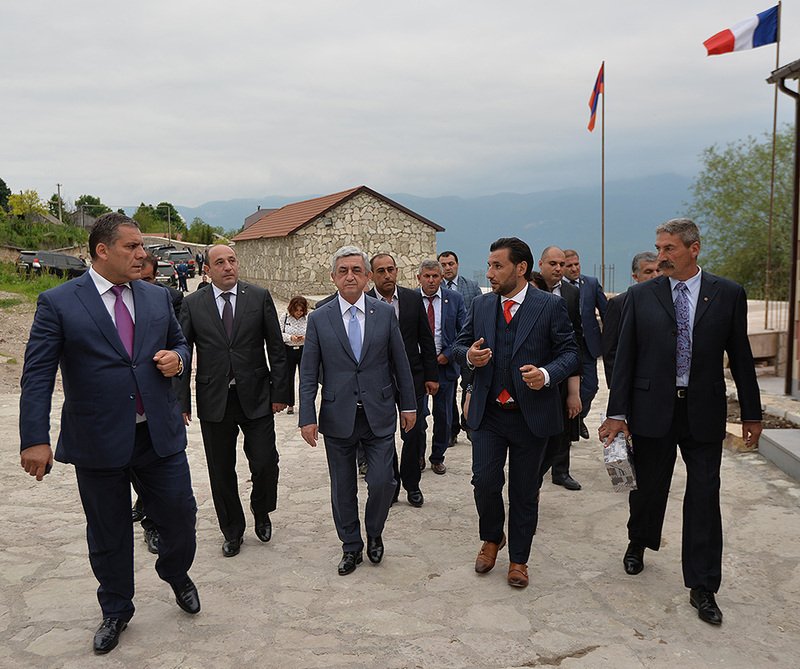 President Sargsyan also visited the French Village hotel complex in Yenokavan to get acquainted with the ongoing construction activities. 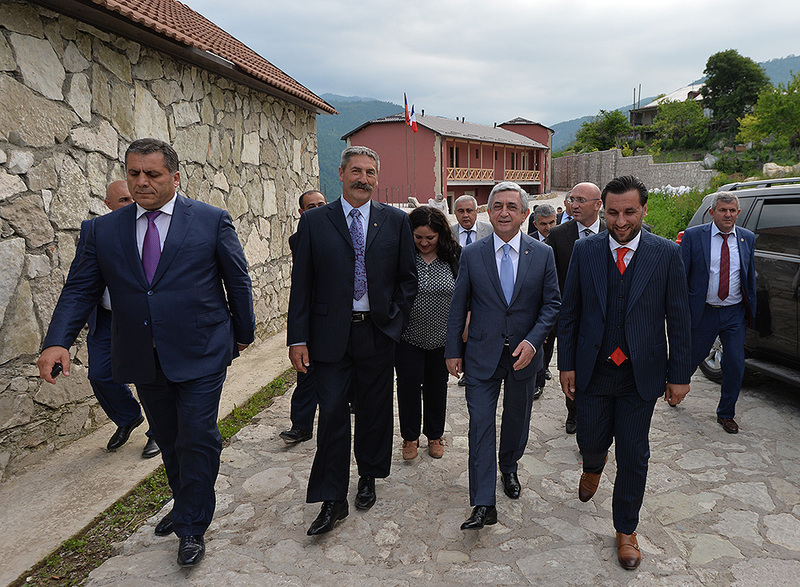 Note that a memorandum of understanding was signed between Yenokavan and the French community of Wilcroz in 2014, under which they became twinned communities. 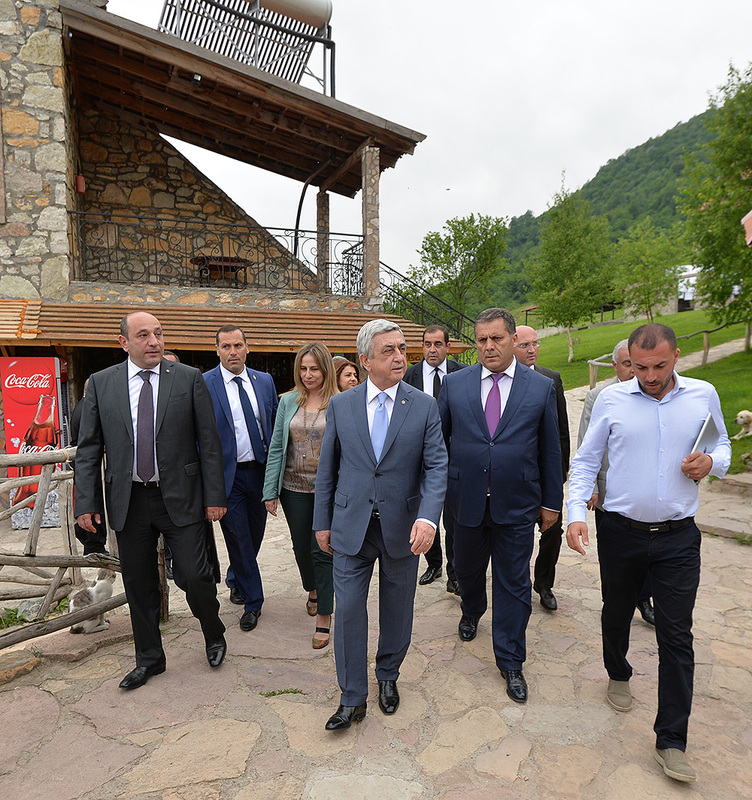 Yenokavan and Wilcroz have engaged in close cooperation aimed at promoting economic development and tourism in particular, with a focus on the creation of a favorable and safe environment conducive to improved conditions for the local populations’ health and vitality.